The USTA Boys’ & Girls’ 12s National Spring Championships this year welcomes watchmaker Longines as a presenting sponsor, and will in turn send the Boys’ 12s division winner to Paris. 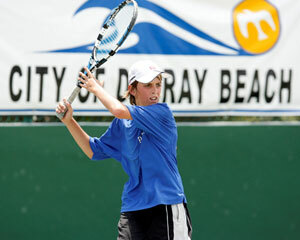 The event brings the country’s highest-ranked 256 players, 12 years old and younger, to compete in Delray Beach, Fla., on April 7-12, 2013. The Spring Championships will also serve as the U.S. qualifier for Longines Future Tennis Aces with the winner of the Boys 12s singles division earning a trip to Paris to play against qualifiers from 16 other nations. Participants must be born after June 1, 2000 to be eligible for the grand prize. In addition to winning an all-expense-paid trip and the opportunity to play tennis in the center of Paris, the U.S. qualifier will compete to receive financing for his tennis equipment until his 16th birthday, courtesy of Longines. At last year’s girls’ event, top-seeded Nicole Conrad won an all-Boca Raton singles final, defeating No. 13 seed Rachel Papavasilopoulos 6-4, 6-2. In the doubles final the unseeded run of Floridians Sasha Belaya of Melbourne and Emma Decoste of Stuart was stopped 6-3, 6-3, by No. 4 seeds Danielle Quevedo, Tyler, Texas, and Emily Thomas, Cincinnati. California’s Sangeet Sridhar won the boys’ event. Longines looks to build upon the success of the program over the past three years. Previous Longines Future Tennis Aces U.S. qualifying tournaments took place at the USTA Billie Jean King National Tennis Center, site of the US Open, in Flushing Meadows, N.Y. The USTA Boys’ & Girls’ 12s National Spring Championships is produced by Players International Management, Inc., sister company of Match Point, Inc. which produces the Delray Beach International Tennis Championships (ATP World Tour & ATP Champions Tour). For more info go to www.YellowTennisBall.com. A Florida Cardio Tennis Workshop will be held in Orlando at the Orlando Tennis Center on Saturday, April 13, 2013, from 9 a.m. to 4 p.m. The workshop fee is $150 including lunch, workshop manual, a music CD, drill DVDs and more. Topics to be covered include: cardio tennis components; the three segments of a proper Cardio Tennis class; the best games for Cardio Tennis; warm-up and cool down exercises and sideline activities; practical peer teaching; marketing and making money; tools for success; and understanding the heart rate monitor and heart rate training. "After taking the course, one is designated a licensed Cardio Tennis Professional, and tennis professionals receive USPTA CEU's and PTR MAP points," says Cardio Tennis Manager Michele Krause. "Fitness professionals who attend receive CEU's from the NASM." For more information or to register go to http://cardiotennistrainingorlando.eventbrite.com.